Food is a drug. Break the shackles of addiction and learn to eat air! 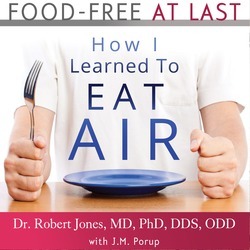 In this detailed guide, Dr. Robert Jones, MD, PhD, DDS, ODD gives you the practical, step-by-step advice you need to transition to the air-only diet. Join him on the cutting edge of human evolution. Go the Power of Air! We will send Food-Free at Last: How I Learned to Eat Air to your Kindle at . Food-Free at Last: How I Learned to Eat Air has been sent successfully to your Kindle!